Bias binding with the Adjustable Bias Binding Foot. Babylock and Husqvarna Viking offer an adjustable bias binding foot. The adjustable bias binder is a clear plastic foot with a screw and markings on the foot that allow for the adjustment of the width of the finished binding. The width of the finished binding is determined and the foot is adjusted to achieve the desired width. The Baby Lock Adjustable Bias Binder Foot is a useful foot whether you are a beginner or an experienced sewer. When using the Adjustable Bias Binder Foot you are able to use various widths of bias binding. Then, use either straight or decorative stitches to sew the binding in place. 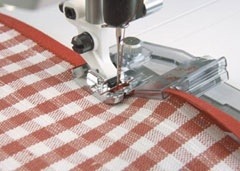 Use the Adjustable Bias Binder Foot when applying bias to vests, placemats, wall hangings, baby bibs or many other things. Babylock Bias Binder Foot (Adjustable) (ESG-ABB). This entry was posted in Notions Know-How FYI, Tips/Techniques FYI and tagged babylock, Bias, binding, garment sewing, Quilting on September 15, 2011 by sewvacoutletblog.